Dr. JoAnn Yanez, AANMC executive director, joins KCAA’s NBC LA affiliate On the Brink to discuss naturopathic approaches to thyroid disease. Full Transcript of Interview Below. Erin Brinker: Welcome back, I’m Erin Brinker. Tobin Brinker: I’m Tobin Brinker. 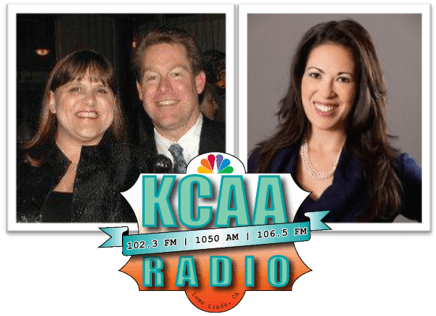 Erin Brinker: We are On the Brink, the morning show on KCAA AM 1050, FM 106.5, and FM 102.3. We are going to shift gears, and I’m super excited to welcome back to the show, Dr. JoAnn Yanez. Erin Brinker: She is the executive director for the Association of Accredited Naturopathic Medical Colleges and the Chair of the Academic Collaborative for Integrative Health. She also serves on the Integrative Healthcare Policy Consortium Education Committee; she weaves a passion for illness prevention into her professional life. She joins us once a month to talk about all things health-related, and today we’re talking about thyroid. Dr. Yanez, welcome to the show. Dr. JoAnn Yanez: Thank you so much. Good morning folks. Erin Brinker: Did you enjoy your holidays? Dr. JoAnn Yanez: I did, I did. We had a restful holiday, very much by design. I’m glad to be back in the saddle now. I believe we’re talking about thyroid today, right? Erin Brinker: … who deal with a thyroid disorder of some kind or another. Dr. JoAnn Yanez: Yes, approximately 20 million Americans have some form of thyroid disease. Most of them are hypothyroid and, like you said, women are impacted more than men. It’s more common in women than men, but there are a number of genetic, nutritional, immune-related underlying causes and contributing factors to thyroid disease. When you think of thyroid disease, there are a number of ways that it can manifest, but hypothyroid by far is the most common, and, of that, many people will have something that’s called Hashimoto’s thyroid disease which is an autoimmune component of thyroid disease. Erin Brinker: That’s what I have. That’s the monkey on my back. The thyroid, explain to people who may not understand what the thyroid is, or what it does. Can you explain to them what it is? Dr. JoAnn Yanez: Absolutely, so the thyroid is this little butterfly-shaped gland that sits in your neck, and it really helps to regulate the speed of our body, how fast our body will regulate the endocrine system. When we’re talking about thyroid disorders, naturopathic doctors look at the whole endocrine system, and how everything is inter-playing with each other. Erin Brinker: … be between one and four. But, her sister has it. Her mom had it. It’s in her family. But, then I know people who it just seems like it came out of the blue. What is the genetic component? Dr. JoAnn Yanez: Well, there is a genetic component at play for many people who have autoimmune disease. Autoimmunity can run in families. If we’re looking at the Hashimoto’s, which is five to eight more times more common in women, and all of the other autoimmune diseases that tend to go and get lumped in like celiac and rheumatoid arthritis and type 1 diabetes, those things can have a genetic component. When we’re looking at a person, we’re looking at the totality of their symptom and social picture, their family history, their environmental predispositions, and all of that as part of the patient picture. Erin Brinker: The naturopathic approach is to look at the whole patient. Dr. JoAnn Yanez: Absolutely. That’s core and primary to naturopathic medicine is we’re taking into consideration the whole thing. If a patient comes in with hypothyroidism, first off, we’re going to understand, what is the root cause of this hypothyroidism: Is it autoimmune? Is it environmental? Is there pituitary/endocrine imbalance? What’s going on here? Dr. JoAnn Yanez: Then, we’re going to look at the whole body: How are the adrenal glands compensating? Where do we need to support this person? Are there nutritional interventions, are there supplements, are there herbs, are there lifestyle factors that are exacerbating what’s already going on here? With patients with Hashimoto’s or the autoimmune thyroid hypothyroidism, we’ll absolutely look at any other inflammatory processes that are going on in their body that would increase inflammation and increase the symptoms that are already happening. Again, it is a full picture. Now, there’s also the other flip side, and there’s Graves’ disease, which is hyperthyroidism. That has its own set of issues and potential problems and cardiac issues and eye issues, and what have you. Naturopathic doctors deal with the full spectrum of endocrine disorders, and this is one very common complaint that people come in with, because, oftentimes, even after they’re given conventional medication, they still may not be feeling optimal. They still may be experiencing fatigue, mental fog, weight gain, hair loss, and those other issues with hypothyroidism, even though they’re medicated, and still not really happy with how their body is feeling. We very often see this low-level unwell person who, they’re just not quite 100% where they want to be. Erin Brinker: I have met people who have heard that they, maybe they’ve taken a blood test, they know that their thyroid is out of whack. Either they’re hyper or hypo, but they’re so just frustrated with conventional medicine, and they’re looking for ways to self-medicate and to find hormone replacement that they can get over-the-counter. That’s not available. If they want to get treatment, they really need to see a doctor. Dr. JoAnn Yanez: Well, and it’s also not wise, because when you’re dealing with your endocrine system, again, it is a system. While you might be able to light a match for a little bit, eventually, that match is going to start a fire. I really do advise folks not to try and self-medicate when they’re dealing with their endocrine system. You can cause a lot of downstream impacts or just not get the results that you’re looking for. On that vein, it’s estimated that 40 to 50% of people are walking around with thyroid disease and don’t even know it. Dr. JoAnn Yanez: They’re just, that’s what I said, they’re this walking around mildly unwell person that just doesn’t even realize that they have underlying disease going on. Again, I think it’s really important to go and be seen, get evaluated. Blood levels will change. The other thing too, is if you’re self-medicating, unless you’re checking your own blood levels, and you know what you’re looking for, you’re not going to know if the therapies that you’re doing for yourself are actually getting you the results, or maybe they’re getting your blood levels of the hormones too high and in an unsafe range. I definitely advise folks to work with a physician, work with a licensed doctor, naturopathic physician, an endocrinologist, and get a team together that can manage your care safely. Erin Brinker: How do people learn more about finding a naturopathic doctor or being a naturopathic doctor? Dr. JoAnn Yanez: Absolutely, we have a wealth of information on our website in regards to becoming a naturopathic doctor, so visit AANMC.org. We have an upcoming webinar with two medical doctors who actually decided to switch gears and become naturopathic doctors coming up in a couple weeks. If you’re looking into a career in naturopathic medicine, we’ll be talking about how to get started. Erin Brinker: Awesome, well, Dr. JoAnn Yanez, thank you so much for joining us today. AANMC for the Association of Naturopathic Medical Colleges.org is where you find all of this information. Again, it’s always a treat to have you on the air, and we will talk to you next month. Dr. JoAnn Yanez: Thank you, talk to you soon. For more information on how naturopathic doctors treat hypothyroidism, click here.